An typical fly fishing net. Lightweight and easy to attach to a fishing vest. See more nets at FishWest. To help new anglers negotiate the sometimes bewildering maze of “fly fishing stuff” available, I’ve put together this simple guide to essential fly fishing accessories. Or, to put it another way, stuff that new anglers will absolutely need the first day they hit the water. Fortunately, the list isn’t especially long, complex or expensive. 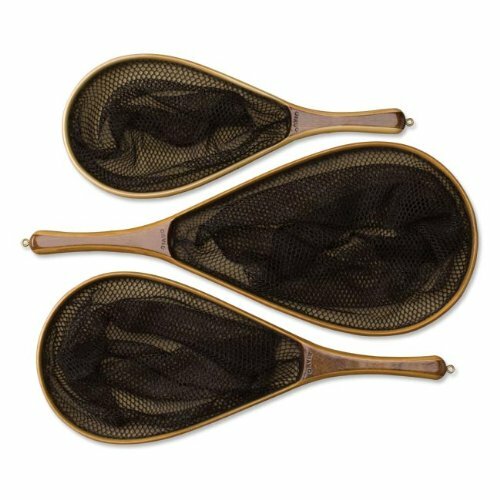 The reason for this short list is because most fly fishing accessories are items that are “nice to have” but not “essential to have.” Even better, I suspect many anglers have a few of these items just lying around the house, patiently waiting for use. Items such as a fishing hat and polarized sunglasses are products many people—not just anglers—already own. While the hat or sunglasses may not be “ideal,” for new anglers they should work just fine and can be upgraded when desire and money is found. Yet, there are certain items that are necessities. Without these items anglers will have a lousy to terrible day fly fishing—or simply be unable to fish at all. Before diving further into the world of fly fishing accessories, let's cover a few items that new anglers should NOT purchase right out of the gate. At some point an angler likely will want to purchase at least some of these accessories. But at the beginning, these are items that aren't needed except for unique circumstances peculiar to the angler. Forceps - For hook removal. Get a pair of forceps if you chase "fish with teeth." But for trout fishing, at least for new anglers, it isn't needed right away. Sinking Fly Line - For beginners, sinking fly line isn't needed unless you plan to primarily fish for bass (or similar species) in deep lakes. Read the Fly Line Guide for more information. Headlamp - Learn to fish at day first, then worry about fishing at night. Stripping Basket - Unless you plan to make hundred foot casts, beginners have zero need for "something else" hanging on their shoulders. Streamside Thermometer - You'l need one eventually. But save it for another day. Landing Glove - For trout? Nope. For "fish with teeth," it would be helpful. Bug Net - You need a net, just not one for bugs at the beginning. Anything Related to Fly Tying - New anglers should concentrate on learning how to fly fish. Worry about learning to tie flies later. Wading Staff - Unless you know for sure you'll primarily be fishing in very fast moving water, a wading staff isn't ideal for new anglers. New anglers should concentrate on "easier water" at first. Specialized Wading Belt - Similarily, a special wading belt isn't needed unless the angler knows with certainly they'll primarily be fishing in very fast, almost dangerous water. Wading Boot Cleats - Cleats that fit over wading boots. Similar to the wading staff, only needed by beginners for rip-roaring fast current. Better to spend extra money and buy a great pair of wading boots instad of cleats, in any event. Stomach Pump - I still have no idea why an anlger would want one of these. There are easier and faster ways to identify what a trout is feeding on than by pumping a poor trout's stomach out. Entomology Kit - For advanced anglers, this is nice to have as it helps identify bugs. But for beginners? Forget it. Packable Trash Container - A large ziploc bag works just as well and probably smells better, too. Waist Pack - For anglers who have far too much stuff or, primarily, for guides. For beginners, just get a decent fly fishing vest instead. Fishing Rod Racks - For home storage of fishing rods. I find the rod tube that came with the fly rod works just fine. Rod racks look nice, but for beginners they absolutely aren't needed. Well, with these items removed from the list of things new anglers should (or in this case, shouldn't, buy), let's move on to what new anglers need to get in order to have a successful day fly fishing. Trust me. It's extraordinary difficult to land anything larger than a small panfish without a net. I learned this the hard way at a young age...when I accidentally tagged into a moderate sized Northern Pike. Without a fishing net, it was impossible to land the fish. And ultimately, in a desperate struggle to beach the fish, the tippet snapped and the fish swam happily away. Moreover, for cath and release fishing, a net is also a mandatory item. For catch and release fishing, it is essential to land the fish and remove the hook as easily as possible. A net makes landing the fish, and then removing the hook, far simpler than by trying to "beach the fish" and do it on-shore. Weight is paramount. By that, I mean how heavy is the net? Unless you have some special reason to have a "huge net," new anglers should buy the lightest net they can find. The net should be large enough for catching and releasing medium sized trout. Remember, you'll be wearing this net every minute you spend fishing. Thus, get a net that is lightweight. A heavy net may feel like a Junior King Kong on the shoulders by the end of a hot day. Let's start with where not to buy it. Wal-Mart, Target and similar big-box type stores. What few nets they might have are heavy and, to put it politely, junk. Offline, any fly shop should have a good selection of fly fishing nets. Stores that specialize in spin-fishing, however, aren't the best places to shop for a net. The reason is because nets used for spin fishing aren't designed to "hang from the back" of an angler like a fly fishing net is. Spin fishing nets also tend to be "deeper" and not as friendly for catch and release fishing. Online, Amazon has a massive selection of nets. A Magnetic Release Holder is how the angler attaches the fly fishing net to their fly fishing vest. How it works is that a magnet exerts around 12 pounds of force, keeping the net secured but yet making it easy to "detach" when the angler grabs the net to land a fish. This is an essential accessory. Without a net release holder, the angler will struggle to grab the net when landing a fish. Magnetic net releases are inexpensive, generally costing no more than $15 for even the best of them. Amazon has by far the largest selection of net release holders, but Cabela's has a nice variety, too. Fly Floatant, also known as fly dressing, is an essential item for any angler. What fly floatant does is help keep flies buoyant. Or, to phrase another way, it keeps dry flies floating on the surface of water. Without fly floatant, what will happen is that dry flies will, soon after being used, become a bit waterlogged and no longer float properly. And a fly that doesn't float properly is a fly that the trout will happily ignore. To use fly floatant, ideally use on a fly that is perfectly dry. Than spray the floatant (or apply the dressing) to the fly. If the fly is already wet, give the fly a good shake (to remove as much water as possible). Then let the fly dry out for a minute or two before applying the floatant. Amazon again has the largest selection of fly floatant available, although Cabela's has a great selection too. Offline, any good fly shop will have fly floatant available. Polarized sunglasses, as most people know, cut through the glare. For fly fishing, what polarized sunglasses provide is a way to "see through the water's glare." In particular, polarized sunglasses allow an angler to better see into the water, not to mention to see their fly when it is floating on the water. Without polarized sunglasses, an angler might as well be "fishing blind." Yes, they are that important. Sunglasses are a highly personal item. You can spend hundreds of dollars on fancy, stylish sunglasses. For fly fishing, however, while such glasses are wonderful to have they aren't especially needed. Basically, all but the cheapest pair of polarized sunglasses work well for "cutting through the glare." That said, there are two features an angler will want in their sunglasses. First, the sunglasses should have scratch-resistant lenses. It's a given that sooner or later a wayward fly or branch will strike the lenses, so scratch-resistant lenses are needed to avoid damaging them. Second, the sunglasses should be durable. During a day of fishing, they'll be squished into pockets, banged around, occasionally dropped and sometimes ignored. Using a "tempermental" pair of sunglasses when fly fishing is a fine way to "not have a pair" of sunglasses by day's end. Cabela's - Where I bought mine. Any angler fishing during the summer needs a hat. The hat, besides helping to prevent sunburn and heatstroke, allows the anglers polarized sunglasses to perform better. The good news is that the hat doesn't need to be a fancy. While there are many "fishing hats" available (most of which work splendidly for fly fishing), the truth is that for new anglers any ball cap will work just fine. So my suggestion for new anglers is to use a ball cap (or similar type hat) that you currently have lying around the house. Then, as you fish more, you can look at buying a more specialized "fishing hat." Still, if you just want to see the types of fishing hats available, head over to Amazon to browse through their huge selection. A leader straightener is designed to keep the leader of a fly fishing rig straight. How it works is that the angler draws the leader through the leader straightener. The heat generated by the friction allows the leader (which is likely bent due to being stored) to become straight. Since a straight leader is a necessity for successful fly fishing, any angler will need one of these handy tools. Happily, leader straigteners are inexpensive and are often available in kits that contain a few other useful items, too. Fishing nippers are like toe nail clippers, just with a fancy name. The purpose of fishing nippers is to cleanly cut excess tippet material (from when an angler attaches a fly to the tippet). While the little toe nail clippers you can buy at a drug store work tolerably well for this job, they don't work nearly as well as nippers do. Nippers provide a much cleaner cut than toe nail clippers, and also cut through tippet material much easier. Nippers only cost a few dollars so they are worth buying "right out of the gate." The purpose of fly line dressing is to clean fly line. In addition, the dressing keeps the line "slick," making the line easier to cast and to pick up off the water during the backcast. In short, if you're planning on dry fly fishing, you'll need some fly line dressing to keep the line maintained and preserved. Strike indicators are primarily used when an angler fishes nymphs. When an angler uses nymphs, the fly disappears beneath the surface making it impossible to see (even with the best polarizd sunglasses). As such, a strike indicator is attached about 6-12 inches away from the fly on the leader. The angler, instead of watching the fly (as they do in dry fly fishing), watch the strike indicator instead. When the angler sees the strike indicator make a "sudden move," the angler knows a fish has struck the fly and should set the hook. Another way to look at strike indicators is that they have the same function as a bobber used for spin fishing, except that it doesn't float. Strike indicators are available at any fly shop as well as any online retailer that sells fly fishing equipment. Cabela's and Amazon have the largest selection to choose from.